The 9th edition of Developer Economics – State of the Developer Nation report now covers all the latest trends in mobile, desktop, IoT and cloud services development. We look at the most popular platforms, languages, vertical markets and hosting providers. Find out which types of development are bringing in the most revenue and which revenue models are succeeding. We also take a deep dive into mobile commerce, the biggest battleground in today’s app economy. This research report delves into the key mobile developer trends, as identified in our survey, and discusses demographics, platforms, languages, revenues, mobile commerce and more! What does the Global Developer Landscape look like? What is the average developer age, gender imbalance and involvement in mobile, desktop, IoT and cloud development across regions? How are language choices distributed across regions? What are dveloper education levels and revenues across languages? What are the latest moves by the big platform players and shifts in developer mindshare? Which desktop platform choices and developer priorities dominate the desktop developer mindset? What is the cloud hosting platform mindshare and language specialization? What are the IoT developer preferences for vertical markets? Who wins in hardware versus software development? What do developer revenues look like across different involvement types? Is there more money in mobile, desktop, IoT or cloud development? How is the mobile app economy shifting towards e-commerce as it matures? 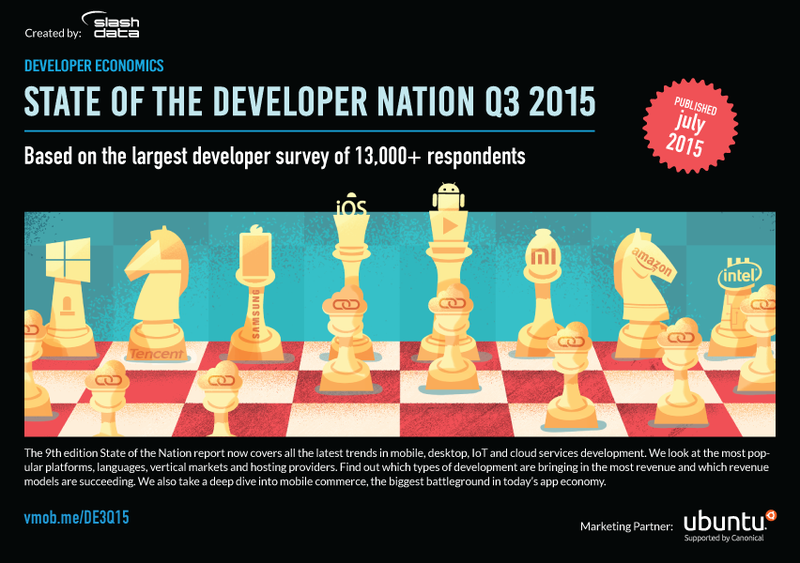 Developer Economics 9th edition reached an impressive 13,000+ respondents from 149 countries around the world. This report is based on a large-scale online developer survey designed, produced, and carried out by VisionMobile, over a period of five weeks between May and June 2015. Respondents to the online survey came from over 149 countries, including major app and IoT development hotspots such as the US, China, India, Israel, UK and Russia and stretching all the way to Kenya, Brazil and Jordan. The geographic reach of this survey is truly reflective of the global scale of the developer economy. The online survey was translated in 7 languages (Chinese, French, Portuguese, Japanese, Korean, Russian, Spanish) and promoted by more than 70 leading community and media partners within the app development industry. Mobile Platforms:And then there were 2?